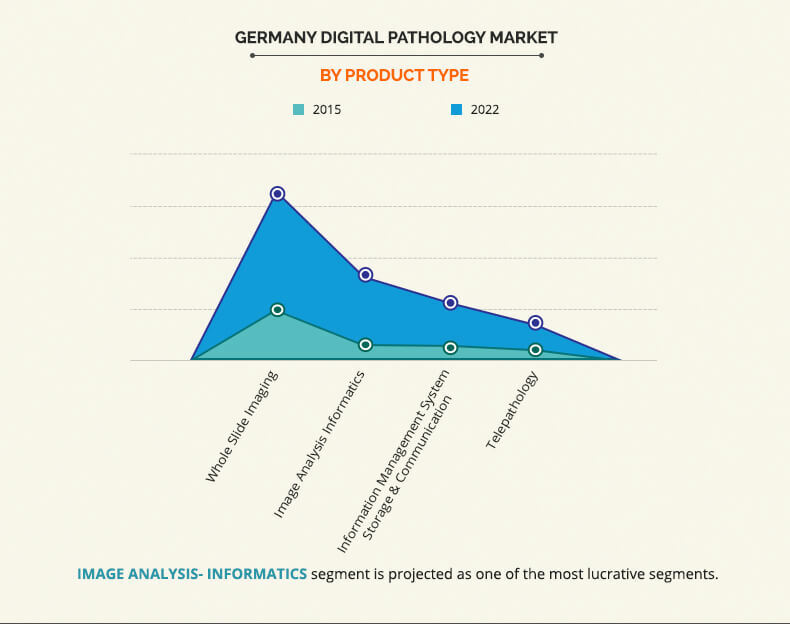 German Digital Pathology Market was valued at $24 million in 2015, and is expected to reach $58 million by 2022, supported by a CAGR of 12.1% during the forecast period 2016 - 2022. Digital pathology is defined as an image-based information setting enabled by computer technology which allows the management of information generated through a digital slide. Digitalization of pathology has led to the automation of tests during diagnosis, such as a single digital instrument can perform tests that were previously performed by five instruments by pathologists. Digital pathology solutions offer high-resolution sample scanning, scrutiny & analysis of images on a computer and online storage of digital slides, which enable pathologists to cross examine slides without physical evidences. 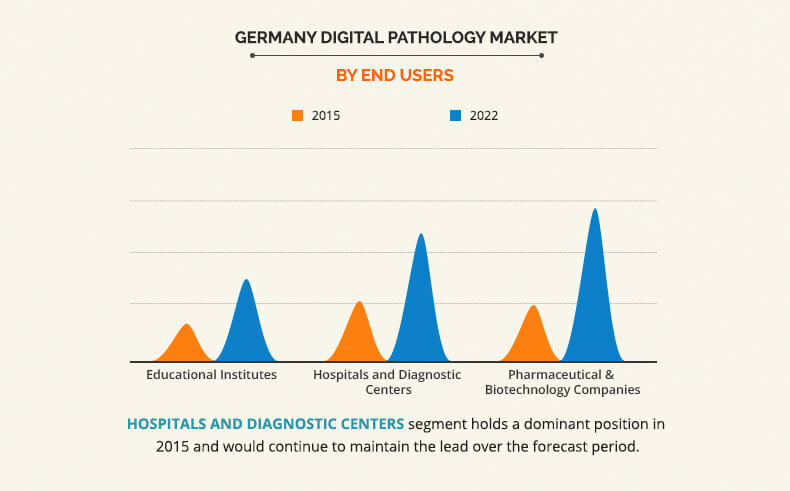 Growth of the market is mainly attributed to factors such as high efficiency of digital pathology systems, ease of virtual transportation of slides, efficient cost of digital pathology products, and increased efficiency. In addition, higher adoption of digital pathology over conventional pathology treatments further drives the world market. For this research report, we conducted about 12 hours of interviews and discussions with a wide range of stakeholders, including upstream and downstream participants. Primary research typically is bulk of our research efforts; however, coherently supported by extensive secondary research. We reviewed over 4,120 product literatures, industry releases, annual reports, and other such documents of key industry participants for better market understanding and competitive intelligence. In addition, authentic industry journals, medical journals, trade associations releases, and government websites have also been reviewed for generating high-value industry insights. Digital pathology gradually replaces the conventional pathology methods. The key reason for the adoption of the digital pathology system is its reduction in cost, fast, and easy delivery of slides. Thus, it helps in efficient analysis of the slide through DPS (digital pathology system). This also includes discussion with other pathologists during analysis. The services provided by the manufactures of scanners include high-resolution sample scanners and software to analyze slides and services for slide storage. The systems are available in desktop size, network infrastructure, server, processor, and computers along with 20-inch monitors. The cost of the systems varies from $30,000 to $1 million. Key players operating in the market include Visiopharm, Digipath Inc. Koninklinje Philips N. V., PerkinElmer, Inc., Danaher Corporation (Leica Microsystem), Nikon Corporation, Carl Zeiss AG, Definiens AG, VMscope GmbH and microDimensions GmbH. Other players in the value chain include Indica Labs, Hamamatsu Photonics Europe GmbH, Pixcelldata Ltd., Glencoe Software Inc. Competitive landscape section includes major players operating within the digital pathology market, with key strategies adopted by them to achieve high monetary value. Entire projections presented in the report are based on analysis of the current trends and highlight the market potential from 2016 to 2022. The report provides an in-depth analysis of the estimated revenues generated as well as major geographies during the forecast period.